It’s good to hear about novel ways of solving problems with Victron Energy products. Ronan (pictured above) is a Telecoms Consultant from Ireland, with a passion for engineering and electric vehicles. For much of the time his BMW i3 Battery Electric Vehicle (BEV) has sufficient range for his daily needs. On occasion though one of his commutes from the Irish countryside to Dublin, involves a trip of around 70 miles. The BMW i3’s official range is 130 to 160 km (80 to 100 miles), but in winter with the heating on, wipers and lights – then the range can be on the limit for that journey. A bit of range security was needed, so Ronan came up with the idea of supplementary battery system. Turning to Victron Energy supplier Paul Cunningham of Marine Electrics, they put together a charging system consisting of 2 x 12.8V-90Ah Lithium batteries in parallel and 2 x Phoenix C12/2000 Inverters in parallel. 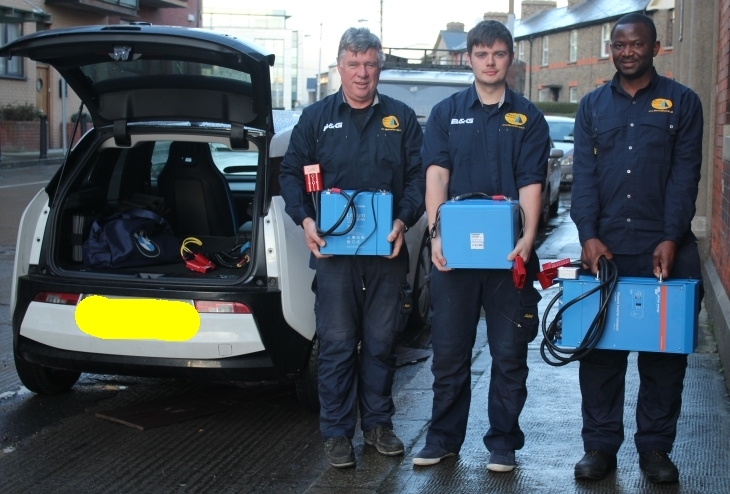 Pictured below from left to right are Paul, Gavin and Roland of Marine Electrics handing over the system. 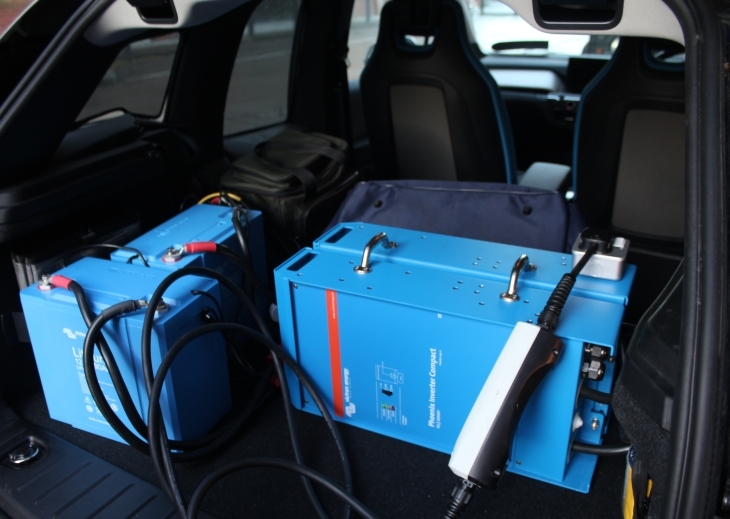 Using the BMW 13A charging lead at 230 VAC, the system can now charge Ronan’s car in an emergency at the side of the road, at a continuous 3,000 Watts. This takes about 45-50 minutes and gives around another 15 km range, which is sufficient to get him to his destination. At work or at home a 30A Victron charger tops up the supplementary battery system, ready for standby use once again. Many thanks to Paul of Marine Electrics for the photos, information and putting me in touch with Ronan. 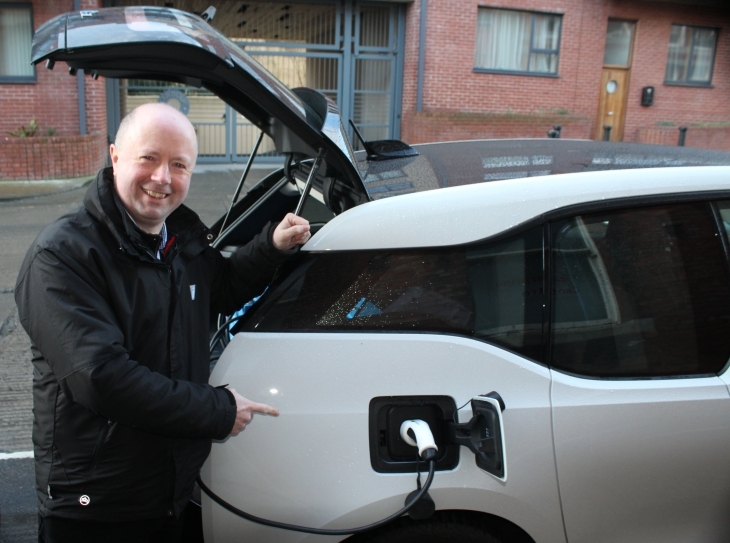 It was a pleasure to speak to Ronan and share a mutual passion for all forms of electric transport. And typical of Irish hospitality, I now have an invite to Ireland! Thanks all. If you have an interesting way of dealing with a challenge or problem using Victron products, we’d love to hear from you.